Those of you who have been waiting for a new Topic Maps book will be happy to hear that one has just been published. It was edited by Naito-san with the contributions of several Japanese people (Komachi-san, at last, but also others), if I read the cover correctly. And, yes, it was written in Japanese, so if, like me, you cannot read Japanese you'll have to settle for looking at the pictures. 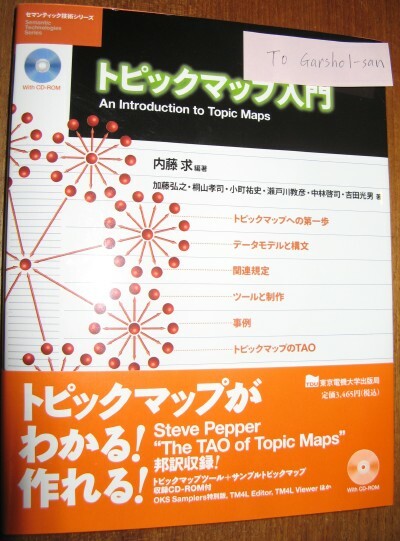 Sadly, I can't tell you the name of the publisher, because the only things on the cover (omitting the orange banner wrapped around the jacket) that are not in Japanese characters are "An Introduction to Topic Maps", "Semantic Technologies Series", "With CD-ROM" and "TDU". The publisher's name might be TDU, of course. Then again, it might not. Chapter 1: Introduction, with what seems to be a fair bit of history and ISO background, as well as an introduction to Topic Maps using the Omnigator. Chapter 2: In-depth tutorial in Topic Maps concepts, including (it seems) a thorough walk-through of TMDM and tutorials on both XTM 1.0 and LTM at the same time. Chapter 3 seems to cover related technologies, such as CXTM, tolog, TMQL, OSL, and TMCL. Chapter 4 seems to be about Topic Maps software, and includes a short tutorial on Ontopoly. Appendix A (at least I assume it's an appendix, since it's not numbered 5) is dedicated to case studies. A.1 lists a number of Japanese ones, including several I've never heard of. (I think it's fair to claim I still haven't, since in many cases I can only read the URLs.) A.2 covers 7 international cases. Appendix B is the TAO of Topic Maps, translated to Japanese. Appendix C is a quick overview of OKS Samplers, which is included on the CD-ROM. Appendix D seems to describe the rest of the CD-ROM contents. 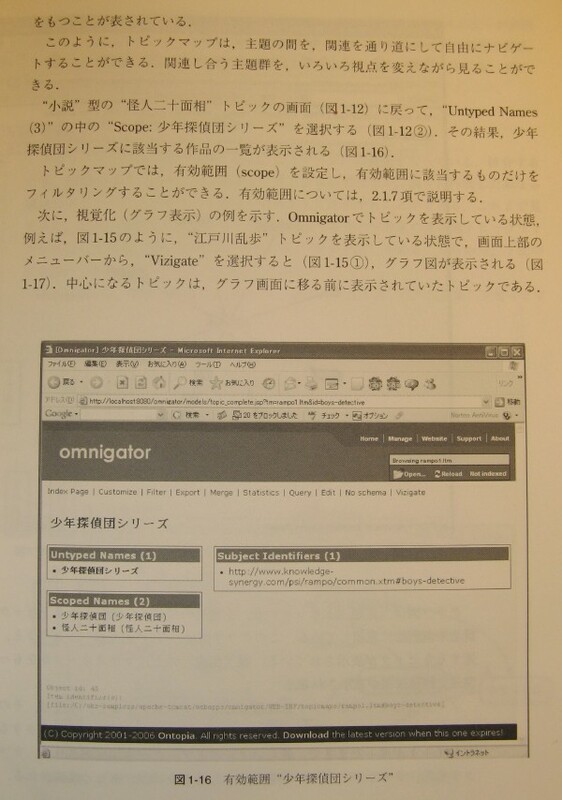 Appendix E looks a lot like the glossary from the XTM 1.0 specification translated to Japanese, but I'm not sure. With index and all it comes to 238 pages, and as far as I can tell a lot of that is material that's hard to come by even in English. Maybe we should try to get Naito-san interested in having the book translated to English? Anyway, congratulations to Naito-san for what seems like a very good job. The title is actually pretty easy to decipher. The first bit is written in Katakana, a syllabary the Japanese use to write loanwords from other languages. Most of the characters represent two letters (a consonant followed by a vowel), and so if you go through them one by one they'll spell out "to-pi-*-ku ma-*-pu". (No, you're not overlooking the space. It's not written; you just have to know it's there.) The stars make the preceding vowel short, so a good transcription would be "topikku mappu"; that is, the English words "topic map" adapted to fit the Japanese sound system. The two characters after that are not Katakana, but Kanji. That is, Chinese characters, each representing a word. They're both common and simple characters. The first means "in", and the second means "gate". In isolation, that is. Together they mean "introduction", which I find an interesting way to write it. The title says "topikku mappu in gate", ie: this is an introduction, it takes you through the gate into Topic Maps. Thank you for this article. I enjoyed it very much. I really do appreciate all your help and support on this publication. Your extraction and deciphering are almost perfect. I was very surprised. Your are good extractor and decipherer. Coauthors of the book are as follows: Mr. Hiroyuki Kato, Mr. Takashi Kiriyama, Mr. Yushi Komachi, Mr. Michihiko Setogawa, Mr. Keiji Nakabayashi, Mr. Mitsuo Yoshida and Motomu Naito. The publisher is Tokyo Denki University Press. And the ISBN of the book is 4-501-54210-1. The title of the tutorial in Chapter 4 is "Let's make topic map."